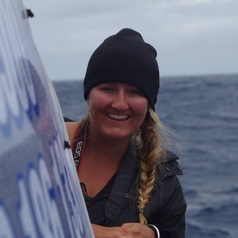 Samantha Andrzejaczek is a PhD student at the University of Western Australia and Australian Institute of Marine Science. During her undergraduate degree at James Cook University she developed an interest in sharks, and upon graduating undertook an honours project on whale sharks in Western Australia. Samantha has now started a PhD looking at the vertical movement of sharks and other pelagic predatory fishes. Her latest study will deploy the latest generation of tagging technology on a variety of shark species, with a particular focus on tiger sharks at Ningaloo Reef.